The Western Reef Heron (Egretta gularis) occurs mainly on the coasts in tropical West Africa, the Red Sea and east to India. There are two records of them as vagrants to the United States - the most recent of which dated in August of 2006. Both sightings occurred on the Atlantic coast in Kittery, Maine and New Castle, New Hampshire. This medium-sized heron has two plumage color forms (morphs - genetic mutations) - an all-white morph and a dark grey morph. An intermediate morph has also been identified. The white morph resembles the Little Egret, but has a thicker bill, duller legs, and a less elegant appearance. The grey morph is unique within its range and is unlikely to be confused with any other species. The Western Reef Heron's breeds in coastal wetlands; typically in colonies with other wading birds. Their nest is a platforms of sticks situated in trees or shrubs. The average clutch consists of two or three eggs. 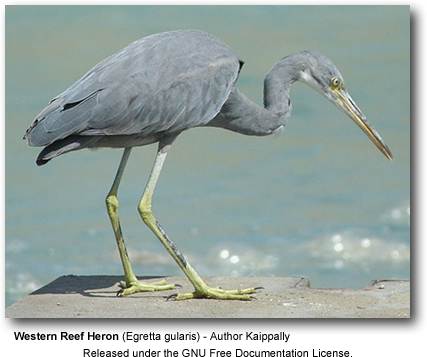 Western Reef Herons eat fish, crustaceans and mollusks. They stalk their prey in shallow water, often running or shuffling their feet. They are also often observed standing still waiting for the right moment to ambush the prey.